Lovely family villa on the edge of town with pool, wifi, air con & pool table. Away from it all, without being too cut off! 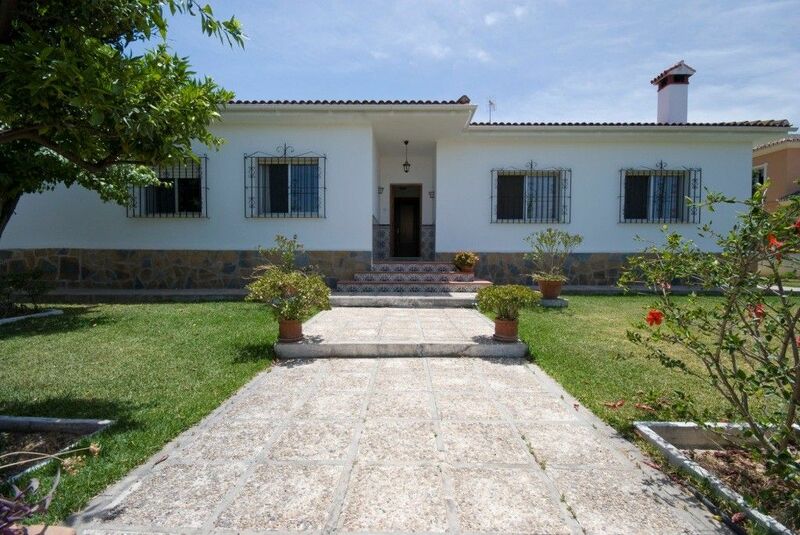 A pretty Spanish villa, ideal for families or groups of friends. Sleeps from 1 to 8 guests. 2 double bedrooms and 1 twin bedroom (extra beds provided free of charge), 4 bathrooms, large family farmhouse style kitchen with sofabed, formal lounge with 2 large sofas and wing-back chairs. 50" TV with basic British TV package, HDMI and USB connections. Plenty of space inside and out to relax in a corner to yourself, even when you are part of a large group. Outside there´s a covered terrace with 3 sofas, an open courtyard with a very scruffy pool table under the shade of a lemon tree, a shady barbeque complete with huge table and plenty of chairs. The swimming pool has a slide (suitable for fun loving adults as well as children), tiled sundecks with plenty of sunloungers. The lawn has fruit trees for shade. The whole pool area is fully fenced in making it safe for families with children. The walk into the town centre from the villa is along our quiet, well lit, cul de sac and then along safely lit, palm tree lined pavements. Four bathrooms, each with separate hot water boilers mean it is possible for larger groups to get ready to go out all at the same time. The wet room is accessed from the outside terrace making it perfect for guests sleeping in the kitchen. The location also makes it ideal for daytime use straight from the pool, preventing accidents on slippery floors in the villa. All units have power cut off switches meaning they automatically switch off after two hours. They can, of course, be turned on again immediately if required. Plenty of parking on the street outside the villa. A bath towel and a hand towel will be provided for each guest. Please bring your own pool towels. 50" television with basic British tv package, DVD, HDMI and USB points. Lots of DVDs are provided. The scruffiest pool table you will ever have played on is outside under the shade of a lemon tree. Less than 10 minutes drive from Lauro Golf and less than half an hour away from plenty of other courses. 1.6m in the shallow end and 2.4m in the deep end. Wide steps for easy access and fully fenced in garden for safety. The villa is ideal for groups and families, but also for couples who enjoy the private space and having a pool to themselves. There are a number of steps within the grounds, making it unsuitable for wheelchairs. We do not allow smoking within the villa at any time, but there are plenty of comfortable, shady chairs outside. The air conditioning is in the kitchen/dining room and all three bedrooms. It is cool in the summer and warm in the winter. I live, with my friendly dogs, in a house in a totally separate area of the grounds. There is a high wall between my gardens and yours and therefore I will not disturb your privacy at all. However, I am on hand should you require any help or some local knowledge. I have plenty of recommendations for good restaurants! What can l say about this holiday other than wonderful. We spent 10 days in June in this villa with our daughter, her husband and two grandchildren. We had everything in the villa for 3 generations to enjoy,pool toys, snooker table, quiet areas to relax, a well equipped kitchen and 4 showers. Anneliese could not do enough for us so much that we went back for 10 days in August just the 2 of us. She knew all the best restaurants to go to; we did not have a bad meal either holiday. She has a great knowledge of the area and was always happy to answer any question we had. We are very happy to return for 2 holidays next year can’t wait. Big thank you to Anneliese. Returning guests are the biggest compliment I can receive and exactly what I strive for. We have just returned from a wonderful weeks stay at this Villa. The full experience from booking to leaving was excellent. Communication from Anneliese before arrival was brilliant, she provided excellent directions and updates on what to do upon arrival in Malaga, and made special arrangements to supply travel cot and highchair for our 2 yr old granddaughter . The Villa itself was great for our family of 7 - 3 spacious air conditioned bedrooms, 2 of which en suite ensured we all had our own private space. The sitting room is very well equipped , with a large screen TV hosting Netflix's was a great success with our oldest Son (Wifi coverage is also excellent) There is plenty of room to relax on the massive sofa's - and the sitting room is a lovely cool room to relax when a break from the sun is needed. The kitchen is as equally spacious, with a massive farm house style table and all the other stuff needed for a family of 7. Where the villa really excels thought is in the outside space - The pool is brilliant with a slide and spring board - great for older kids and parents/grandparents too. The pool is very well cared for - really spotless and frequently water tested etc by the owner. There are plenty of sun loungers and large box of every type of inflatable a family would need. The garden areas are well landscaped and filled with Orange/ fig/ pear trees – lovely for picking any low hanging fruit !. The Pool and upper garden area also benefit from a lockable gate – which gives added peace of mind if visiting with toddlers . The lower garden area is kitted out with a really large rustic dinning table , outside cooking area and a large Smeg fridge – a brilliant area for evening dining . The outside area also benefits from an outside bathroom - with a really excellent shower with jet sprays from every angle, and an enormous bath big enough for 2. A real added bonus is the Pool table outside - this provided plenty of evening entertainment for our group. It was very hot during our stay, so we spend most of our days and evening around the pool and in the many area’s to relax in the garden – the villa offered more than enough to keep everyone happy and entertained. A very special thank you to Anneliese who ensured we had everything we needed, and was most accommodating with arrival and departure times. What a fabulous review, thank you so much for taking the time to write it. The villa itself is very nice and roomy. Would suit a family upto 5-6 people easily. Lots of pots and pans and a barbecue. The owner lives close and is helpful, when you need assistance. If you have never been to rural Spain, bare in mind that there are lots of dogs and chickens. There were some issues, though: the toilet seats need changing, as they smell (even though we cleaned them 2-3 times a day), when you take a shower in en-suite bathroom, it leaks in the corner. The pool is lovely but 1.6 m in the shallow end, which makes it a challenge for children, who are not confident swimmers. The air conditioner is on timer, and cannot be left for the night. For us it meant getting up at night to switch it on again, which is not a relaxing experience. Sleeping with the open windows was not an option either because of the dogs and in July it is too hot for most of the night anyway. There is no air conditioner in the lounge, which makes it too hot to use after midday. The fan provided did not make a lot of difference. Otherwise, it was lovely. We like Alhaurin de la Torre with its traditional and at the same time modern feel and loads of restaurants. The airport and the sea are both within 20 min. with many beaches to choose from. Thank you for taking the time to write a review and I am glad that, overall, you liked the villa. To address some points you have made. I am appalled to read about the toilet seats and the need to clean 2 to 3 times a day. I would not expect a guest to even contemplate doing such a thing. I pride myself on the cleanliness of the villa and have a very loyal team of extremely particular ladies who clean with me. I have spoken to them about this issue and personally inspected the villa before they started and after they finished prior to these guests arrival. None of us were aware of a problem. I wish on the 2 or 3 times that I saw these guests during their stay and asked if everything was ok that they had mentioned it. I would have welcomed the opportunity to inspect there and then and rectify it immediately. I now have guests in the villa who have not mentioned anything so I will have to wait til they go to make another inspection. Any problems I find will, of course, be addressed immediately. The same with regard to the shower. I will inspect it as soon as possible and fix any leaks I find. Yes the pool is deep. It has large, wide Roman steps to enter the water and children are normally happy to float from these with their swim aids. I am very proud of the amount of children who have learnt to swim in my pool. Please note that in Andalucia it is extemely common to have a deep pool as often they are constructed from old water deposits. It is very important to ask the depth of a pool prior to booking if you have children who are scared of deep water as these guests did. Air conditioning timer switches are very common here for energy conservation, to prevent guests being able to leave it on all day when they go out. The villa is traditionally built and if managed properly, ie shutters shut during the day, can be kept quite cool, even in the hotter months. I have extra fans in the villa for guests use and a multi socket extension lead in the lounge so that more fans can be put in there if required. Yes there are dogs and chickens in the area, as indeed there is other wildlife. We can go for days without hearing anything and then on occasions have every dog in the neighbourhood barking like they are in 101 Dalmatians for no apparent reason. I think the most important thing I can say is that guests should always ask their property manager questions prior to booking and speak to them during their stay if they have any problems. Had a wonderful time, very relaxing! Had all the comforts of home without the Irish weather! Villa was beautifully maintained with gorgeous gardens and a lovely pool with loads of sun loungers! Local restaurant food was delicious and very cheap! had a great time and would definitely come back again....thanks Analiese! Thank you! See you again soon by the sound of it! We had an amazing holiday in this lovely villa. Anneliese [the owner] was on hand should we need any assistance and she was really helpful. There were 6 adults in our party and the villa was lovely and spacious and we spent most of our time in or around the swimming pool. The garden was lovely and it was a very relaxing holiday. We enjoyed the facilities the villa offered and because of that we only ate out twice during our 7 day stay. We would highly recommend this villa and we would certainly be returning. Lovely. Thank you. The best compliment is when guests say they are looking forward to returning. Fantastic! I am so glad you enoyed yourselves! The villa will be a tranquil, relaxing world of your own but within a few minutes of bars, shops and restaurants. Two minutes from the mountainous countryside, 20 minutes from the beaches of Torremolinos. 30 minutes from Benalmadena Costa. Lauro Golf is only 6 minutes away and dozens of golf courses are within half an hours drive. The Plaza Mayor shopping and entertainment complex is 15 minutes away, with around 30 restaurants, all the major clothing retailers, a multi screen cinema and bowling alley. Other Activities: There is everything you could possibly wish for within a 20 minute drive of this villa. An hour and a half and you can ski in the Sierra Nevada! Golf: Lauro Golf Course is only a 6 minute drive from the villa. It is beautiful. Parador Golf in Malaga is only a 20 minute drive away. Alhaurin Golf is the next nearest at just under half an hour, then Mijas Golf, Santana Golf and dozens more within three quarters of an hour! Ski: Only two hours in the car and you can be in the ski resort of the Sierra Nevada. Well worth a visit in the summer for the scenery as well as the winter. Total price is per week in pounds for the rental of the whole villa, irrespective of the amount of guests. I will provide two extra single beds, high chair and cot free of charge on request. 200 pounds sterling refundable deposit against accidental damage or any excessive cleaning required will be due with the booking deposit please. Other baby equipment, household and beauty goods are available to hire on request.. I do NOT charge an additional cleaning fee. I do NOT charge for the air conditioning.